Note; We do not manufacture or sell this material, our experience & skill with the material allows us to offer you this unique option! Indoor Options Galore! The enjoyment of water in your life does not need to end in the backyard. Here in Minnesota we know all too well how quickly the seasons change. Maybe you’ve dreamed of an indoor water garden, a spa or pool falls, an entryway weep wall or maybe you are looking for options and something unique to make your statement with water indoors. 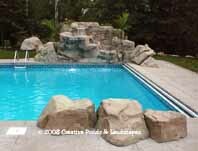 When you choose Creative Ponds & Landscapes you are receiving the benefits of 13 years of commercial & residential experience in the installation of themed & naturalistic water features and other faux rock finishes, indoors and out. Put the experience and design options to work for you! 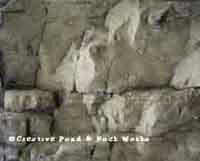 Click Here to view photos of various projects created with these artificial rock panels and faux rock techniques.